Summer was, as ever, a great time of year to go boating with your family and spend time just enjoying the delights that boating has to offer. Now that summer has drawn to a close it is essential that before storing or mooring your boat, that you check the vessel for any problems that might be occurring and potentially putting you or your boat in danger. Encapsulation of the works being undertaken. 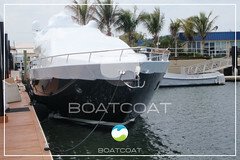 If you notice a problem with your boat the best practice is to take care of it right away and undertake the necessary repairs. One common issue found amongst boat owners around the world is the floor becoming rotten or damaged and this can be very dangerous if not taken care of immediately. 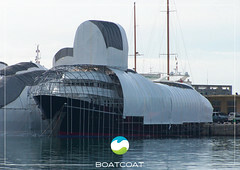 The reasons are obvious: water saturation through leaking glass laminate and plywood. Sometimes this can be repaired through the treatment of the existing wood or by drilling access holes in the glass laminate, injecting sealer and, if the damage is severe, Layup & Laminating Resin. Often, however, it is easier and more thorough just to pull up the old floor and replace it with new wood. Whilst undertaking the floor replacement tasks, there are some special considerations regarding type of wood and its treatment before the wood is installed. However, special attention needs to be given to protecting the works in action and the long term winterisation of your boat. 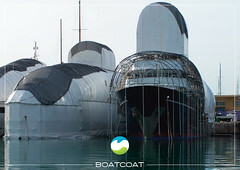 Throughout this process, regardless of size or shape boatcoat has the boat covering solution to meet all needs. 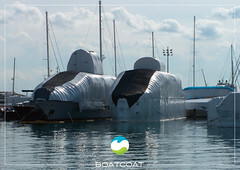 Our shrink wrap film can create work tents or shelters that provide complete environmental containment around a yacht or boat maintenance project. 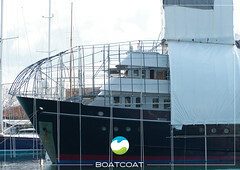 Wrapping a scaffold structure around a vessel creates a completely sealed skin that keeps dust in and the weather out. 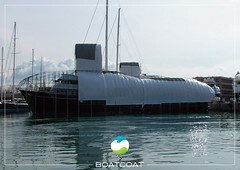 Another option is applying the shrink wrap sheeting straight on to the boat itself in order to simply and safely cocoon the object, ready for the boat refurbishment. 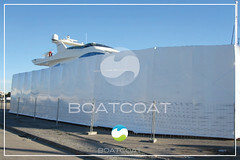 Our solutions offer cost-effective alternatives to boat covers, tarpaulin covers and other boat storage options. 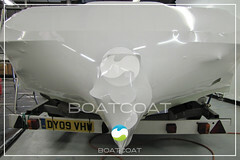 This option covers usage from boat construction and maintenance works through to boat winterisation needs. 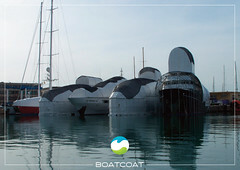 Boatcoat has over 10 years’ experience in installing custom fit covers and as the demand for quality boat covers has grown we began offering training and accreditation in this area whilst supplying the raw materials to a growing number of Boatcoat approved installers which now covers the whole of Europe.